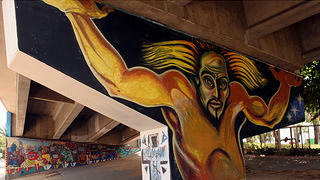 For the largest collection of outdoor murals in the United States, head to the area underneath the intersection of Interstate 5 and the San Diego-Coronado Bay Bridge in San Diego. 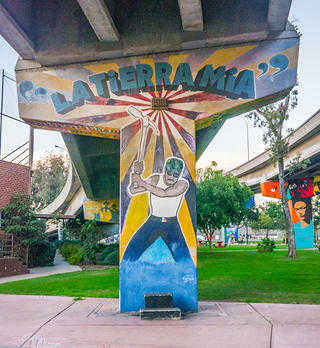 There, in the city’s Barrio Logan neighborhood, you’ll find Chicano Park, a 7.4-acre community space established in 1970 and designated a National Historic Landmark in December 2016. 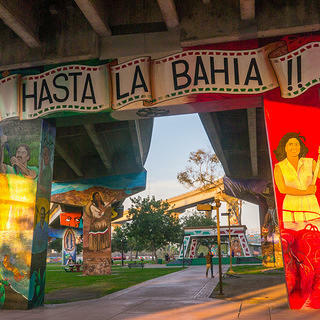 You can read all about the park’s history in the Summer 2017 issue of Preservation magazine—like how constructing that Interstate 5 and San Diego-Coronado Bay Bridge intersection led to the displacement of so many Barrio Logan residents, and how Chicano Park was formed underneath that intersection after a peaceful 12-day occupation by those residents who remained. And then there are the murals. Painted on the bridge pylons that tower over the park, these murals were not created just a way to beautify a park space in an unlikely location. They were created to commemorate the struggle to create the park and to reclaim the space for the neighborhood. 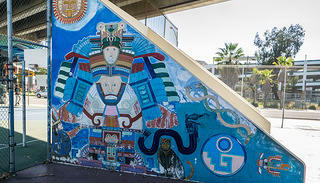 They depict different aspects of Chicano culture, including historical events, Mesoamerican influences, and mythology. There are plant and animal imagery and scenes of revolutionary struggles. 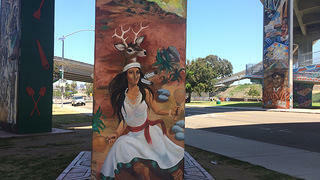 Some murals touch on themes of immigration and feminism. Others depict important historical figures and civil rights leaders—Che Guevara, Pancho Villa, Cesar Chavez, Frida Kahlo. 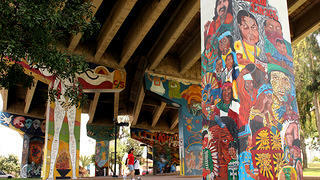 “These murals have been created by local, state, regional, and pretty much internationally known artists,” says Josephine Talamantez, who was among the group of protestors back in 1970 and who has since led the Chicano Park Steering Committee and submitted the application for National Historic Landmark status. She points to one artist in particular—Salvador Torres. 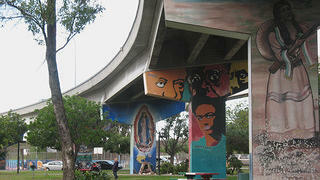 A longtime Barrio Logan resident, Torres’ family house was lost to the freeway construction. 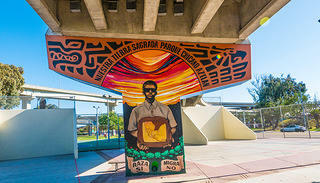 On March 23, 1973, artists—including Torres and Victor Ochoa with groups Los Toltecas en Aztán, from the Centro Cultural de la Raza (a cultural arts center located in Balboa Park), and el Congreso de Artistas Chicanos en Aztlán, an artist collective from San Diego—gathered at the park and began painting. 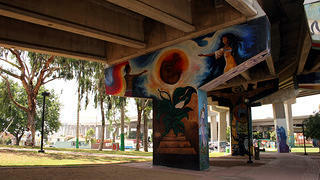 Today, there are dozens of murals throughout Chicano Park. There’s a long list of renowned artists who have contributed to the collection throughout the years: Irma Barbosa, Isaias Crow, Ricardo Favela, Charles Felix, Yolanda Lopez, José Montoya, Juanishi Orosco, Celia Herrera Rodriguez, Guillermo Rosette, Mario Torero, Esteban Villa. 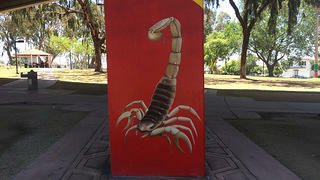 Many non-artists have contributed to the creation and ongoing maintenance of the murals, as well. Many of the murals have been restored over time. 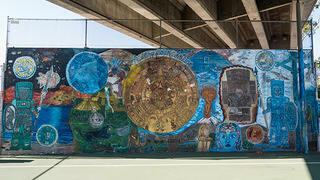 The latest round of work was completed in August 2012, when 18 murals were restored using state funds. Here, we take a closer look at some of these monumental works of art.